This project started from a few conversations with my good friend Richard about what to build with a couple of rifles we owned that were in need of some attention. My rifle is a Remington Model 7 – .223 with the headspace being at max limits and his rifle being an old Remington 788 – .223 that was in need of a lot of work. We both were thinking .17 Rem from the past experience with the one I owned but, with all the .204 hype and a tub full of .223 brass the Tac 20 became the cartridge of choice. 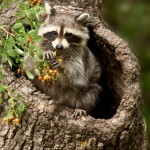 I did the searching and found the rifle barrels, reloading dies, chamber reamer, go-no go gauges, Weaver V-16 rifle scopes, and the first few boxes of bullets all at MidwayUSA.com. The Remington Model 7 has a Richards Micro Fit stock already on it that was purchased for the .223 to dress it up and in thought of a project in the future. The 788 had an after market Ram Line stock already on it and was kept for this project as well. 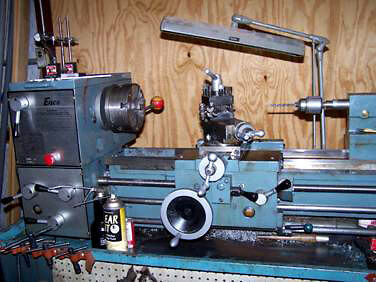 12” x 36” metal lathe 2nd hand a few years back with the intention of building rifles. Time to put it to work now. 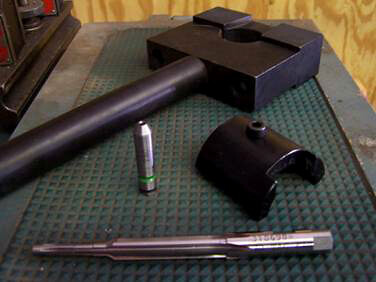 With my knowledge of firearms and Machine work this is not a difficult task with the correct tools. The barrels were pre contoured blanks right at 27” long. The threading, chambering, and crowning were done on the Model 7 first. The action was trued and the bolt was lapped and the barrel was installed. The barreled action was then bead blasted for a satin grey appearance. The stock needed the barrel channel cut out for the new barreled action. It got a complete glass bedding job and it was ready to go to the range for some fire forming and testing. The model 788 was next with the same stuff on the barrel but, this rifle had some dangerous trigger problems that took some fixing and the stock took on a complete make over. I performed a complete bedding project with a custom paint job on the stock. The action and accessories got a coat of brushed stainless GUN-KOTE from Brownells to finish the appearance of stainless to match the barrel. The Brass forming process is easy. I used a lot of Military LC Head stamp brass. A bunch needed to be discarded because the neck thickness was not correct. Winchester brass had a bad tendency to crush under the shoulder. Remington brass worked pretty good with some having a small wave under the shoulder. The case forming die may be a nice thing to have if you’re using premium brass to keep from ruining some. I just threw the ruined ones in the trash and segregated after my tub of brass was empty. Out side neck dia. is .228-.229 on the brass I’ve been using which is LC 84. The Range testing was done completely with the Model 7. 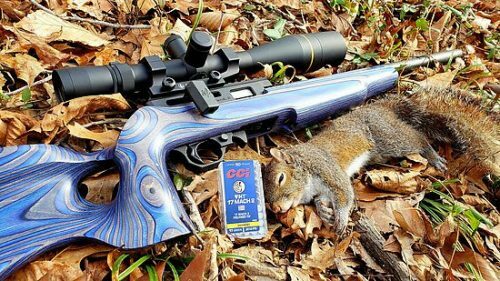 The 788 is using the same hunting ammo that is loaded for the little 7 with as good or better accuracy results. I started loading with powder on my shelf as most of us would do. 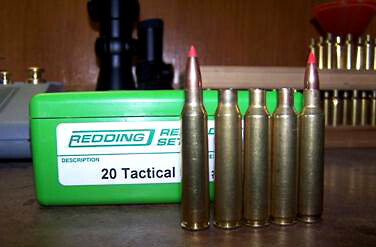 The H322 was my first choice as it is excellent in the .223 and the little .17 Remington. Starting with some data acquired from Small Caliber News website and the Hodgden .204 Ruger data I started with 26.0 gr. of H322, Fed 205, with a 32 grain V-Max . The first string through the Chrony was a WOW – 4254fps average. The bolt opened easy but, the primers showed craters. The first 5 shot group measured .828″ and was more than pleasing on a rifle that was built by “Me”. The load has been decreased to a charge of 25.5 gr. that made the primer crater disappear and was easier on the 788 also. 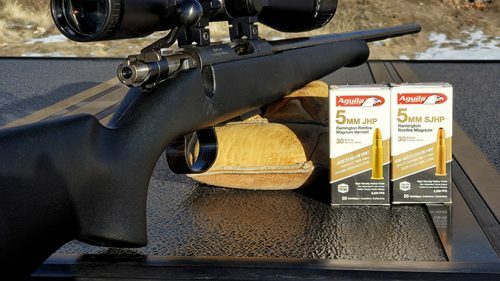 Both of the rifles will shoot that load between .500″ – .800″ @ 100 yards regularly. The 39 grain Sierra Blitz King has only had one powder behind it which is W-748. The load is 27.0 grs. of W-748 a 39 gr. BK @ 3880 fps. With 5 shots making a pretty hole measuring .504″. These are the powders I have tried with the 32 gr. V-Max . 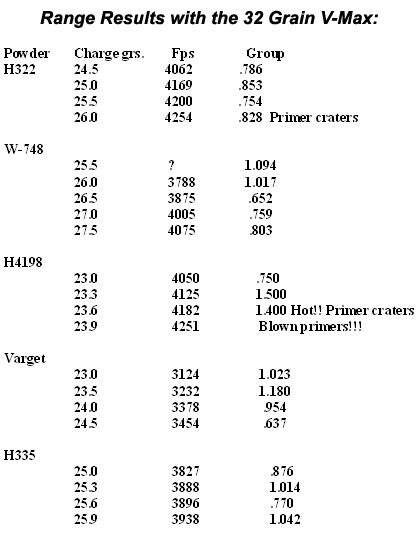 I had all on hand except the H4198 which is a very sensitive powder in this cartiridge. Notice the .3 gr increments and the velocity increase. Be careful with H4198 if you try it in the Tac 20. The field testing has been performed by both rifles and not enough of it as usual. 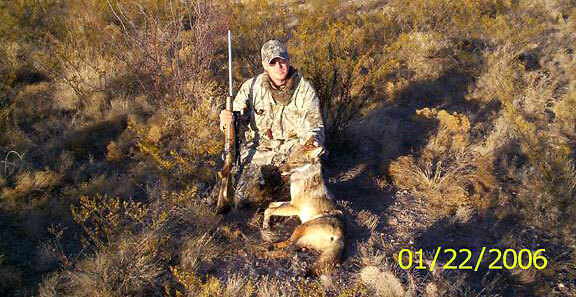 The first trip to the field for coyotes was a success. Richard and I got a small female to come in after about 15 minutes but, she hung up about 200 yards out. Richard let a 39 gr. Blitz King loose from the 788. It was a front chest shot that hit a little right. 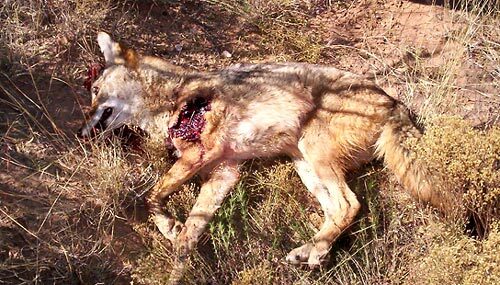 The coyote was struck in the front shoulder bone which had nasty but, not fatal results. The coyote took off like it wasn’t even hit. 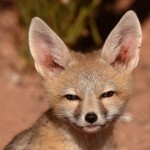 I immediately began ki-yi’s on the open reed and stopped the coyote. 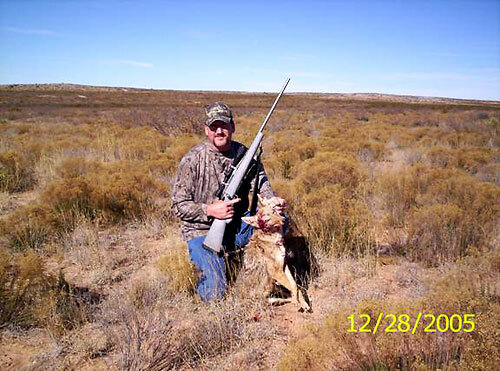 The second shot was fatal at 300 yards as it hit the coyote in the eye socket. 39gr BlitzKing @ 200 yds. The next trip out was with my wife Julie. I was focused on getting her first coyote this trip out. We got some barkers on the first set so we packed up and went around to the other side of them. The 2nd stand was about ¼ mile from where we had heard the coyotes on the previous stand. I called in a coyote quick after a howl or two and it came in on the wrong side of her. The little Tac 20 had to take it out before she even got to see it. The coyote was about 25 yards looking straight at me when it stopped. The 39 gr. 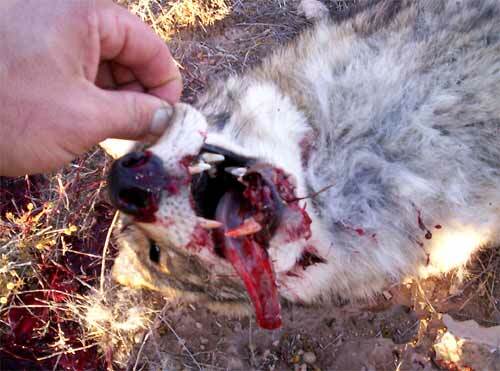 BlitzKing hit the coyote in the chest and exited out the side of the ribs with nasty results. This coyote only moved about 14 inches straight down. Julie did shoot her first coyote on the 4th stand but, not with a Tac 20. Julie has her own custom Model 7 in .243 win. 39 gr. BlitzKing @ 25 yds. The next trip out with Richard we had an old male show up on this stand quick. He was in the crosshairs of the Model 7 in less than 2 minutes. I was using the 32 gr. V-Max on this day to see if it was better on fur. 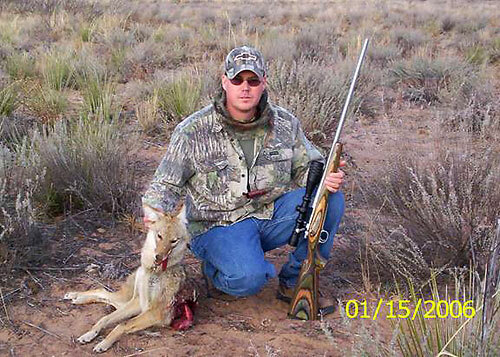 The coyote was stopped at 30 yards for this shot. 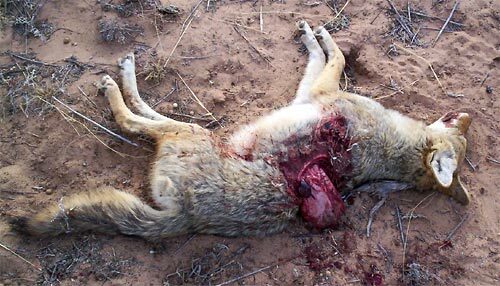 It was not best test for the bullet but, it didn’t damage any fur and the coyote dropped right where he was standing. 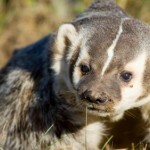 I named this topic in the Varminter.com forums – “Right in the Kisser” as the photo will show why. The Tactical 20 has been a learning experience for me all the way through the projects. From the gun smithing to the reloading to the testing at the range and in the field it has been fun and educational for me. I hope test more bullets in the near future and get back after some coyotes pretty quick. 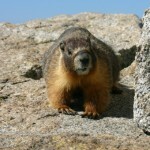 During the summer I will do some testing on Prairie Dogs and get an update on the results for my report. 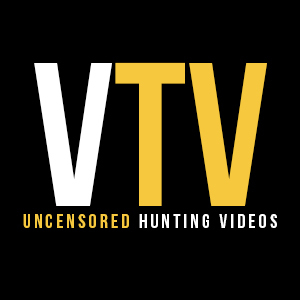 I would like to thank Glen Shaffer for putting this idea into my head and Eric Mayer for taking the time to look at it and giving me the opportunity to put it on Varminter.com.